Help your neighbors in need stay warm this winter! Imagine the stress of approaching the cold months with an apprehension that goes beyond snowy roads and is instead derived from the question no family should have to ask: will I make it through the winter? Limited-income families in our city will try to keep their houses warm so their children can sleep well at night. They will struggle to keep their pipes from freezing so they can shower for work. They will stretch their thin incomes and still not come up with the necessary funds to stay warm. But you can help! By partnering with Dollar Energy Fund for a unique and exciting fundraising opportunity on January 24 & 25, you can raise funds that will go directly toward helping these families in need. At the end of January, join us in this effort by participating in the fifth annual Cool Down for Warmth. In the dead of winter, a house will be constructed using ice blocks in downtown Pittsburgh in Market Square. The goal of the program is to build awareness for the many families who will go without heat during these winter months, while attempting to raise money for utility assistance grants. The best news is that all donations collected will receive a dollar-for-dollar match from our partnering utility companies. The Cool Down for Warmth event will also feature a Bowls for Warmth Soup Tasting, presented by BNY Mellon. Join us for lunch in the Square! 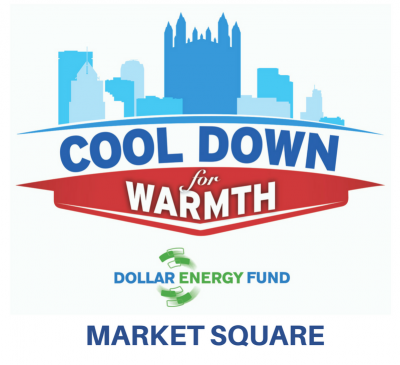 If you have any questions regarding the Cool Down for Warmth event, we encourage you to contact us at events@dollarenergy.org.